Situated amongst mountains and forests, prepare to step into an oasis of tranquillity. Set on the hill of the Healing Buddha’s Mountain in the sacred area of Yakushiyama, you’ll find Beniya Mukayu, a spiritual retreat hidden in West Japan. 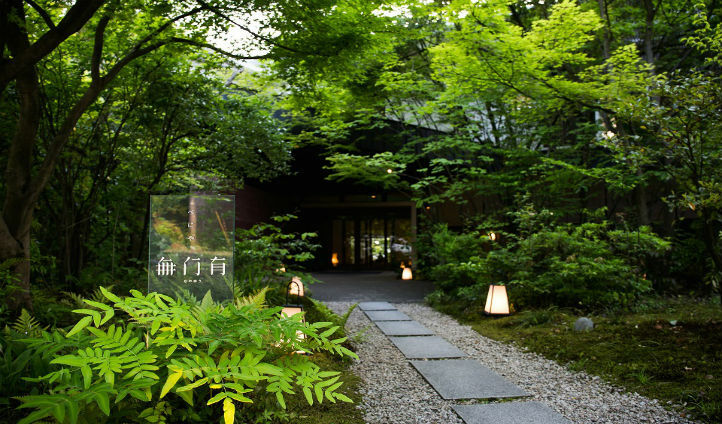 Mukayu, meaning ‘in the natural state’, is the perfect hotel to clear and rejuvenate the mind. Start the day with their daily morning yoga sessions followed by a trip to their exquisite spa. Learn the traditional ways of Soba Making or trek to the Tsurugadaki Waterfall, and end the day indulging your taste buds with their delicious Japanese delicacies. Enclosed by wild gardens and undisturbed nature, a step into Beniya Mukaya is a step into the ultimate haven of peacefulness. 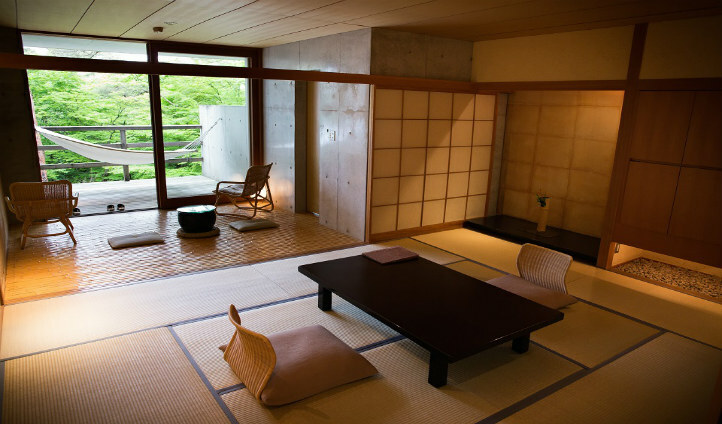 Located in West Japan in the Ishikawa prefecture, you’ll find Beniya Mukaya. Tucked away in the mountains and hidden amongst greenery, the tranquil retreat is placed in the small spa town of Yamashiro. With a mere 30 minute transfer drive from Komatsu Airport, its prime location is perfectly placed in the midst of tranquillity, but a close drive to an array of wonderful and cultural sites. A five minute walk from the retreat and you’ll be in Yamashiro Onsen Town where you’ll spot traditional Japanese temples and shrines. A 40 minute drive from the retreat will take you to the cultural city of Kanazawa where you can roam ancient villages and abundant cultural sites. Where traditional meets contemporary, the 17 rooms at Beniya Mukaya incorporate a traditional Ryokan style combined with a western style. A simple and minimalistic design, the spacious sanctuaries are the perfect place to relax and reflect. Each room is equipped with its own private terrace overlooking views of the gardens or the town of Yamashiro. Along with complementary WIFI, expect to find your own private open-air bath, as well as large communal baths with open-air hot springs and saunas that you can access from your room. The uncluttered spaces are filled with natural materials with a blend of warm and neutral tones that make it the perfect spot to release your inner Zen. Apart from its peaceful ambience and relaxing atmosphere, the Entai Spa is what really makes this hideaway resort one of our favourites. Their spiritual spa takes on ancient traditions and methods once used by monks that are believed to have the power to cure and heal. Choosing between their endless treatments might be the hardest decision you’ll have to make here, but their custom-made menu option might make your decision a little easier. Their spa is so indulgent we’ve never felt so relaxed, especially a dip in the hot springs beforehand tops it all. A trip to Entai Spa will make you feel totally calm and tranquil, perfect before boarding a flight back home.